Uno has been a favourite for Australian families for decades. The rules of the game are easy enough for children to understand and the game has enough excitement to keep adults entertained. It’s a quick moving game that keeps you on your toes and even though the rules of the game are quite simple, using strategy to be the first to get rid of your cards is imperative. This article will teach you how to play this classic game which was invented in America in the early 1970s by Merle Robbins. 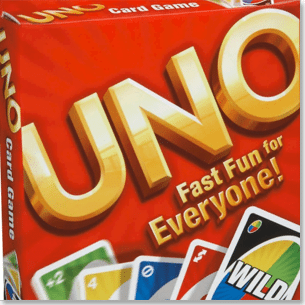 Uno was actually created as a family game by an avid card player who worked as a barber in Ohio as his day job. Merle Robbins first introduced the game to his own family in 1971 and it wasn’t long after that he paid to have more Uno card packs printed. Other investors joined the venture and the game continued to grow in popularity until it eventually became a Mattel product, and from there the number of Uno packs distributed sky-rocketed. In Australia most department stores and chain toy stores sell Uno decks and you still see families wheeling out this old classic, year after year. In short, the aim of the game is to win the most points. This is done in two parts – first you must be the first player to get rid of all your cards. There are different strategies to do this, but you must only discard cards in your turn in a way that abide by the rules (more on this later). The first player to successfully unload all their cards is the only player who is awarded points for that round. Points come from how many cards are left in the other players’ hands, and different cards are worth different amounts. The player with the most points at the ends of all the rounds wins the game. How Many Cards are There in Uno? There are 108 cards in Uno and below we give an overview of what those cards are, and what they all mean. 8 Draw Two Cards: there are two Draw Two Cards in each colour. When you put down a Draw Two Card the player next to you must pick up two cards from the Draw pile. 8 Reverse Cards: there are two Reverse Cards in each colour. Reverse Cards reverse the direction of the game, if it was going in a clock-wise direction, players now take their turns in an anti-clockwise direction. 8 Skip Cards: there are two Skip Cards in each colour. When a Skip Card is played the next player’s turn is skipped, and the player next to them gets to have their go. 4 Wild Cards: when a player puts down a Wild Card they get to change the colour being played. They also get to put down a card of the new chosen colour afterward. Players can play a Wild Card even if they have other cards that they could play. 4 Wild Draw Four Cards: A player can only play a Wild Draw Four Card if they don’t have a card the same colour as the last card played. A Wild Draw Four Card means whoever plays it gets to pick a new colour and the player next to them must pick up four extra cards. 1/ Deal each player 7 cards face down. Stack the rest of the cards in the middle of the gameplay and turn the first card of the pack upwards so it makes another pile next to the stack. The cards facing downwards will be the Draw pile and the cards facing up will be the Discard pile. 2/ The first card drawn has a big impact on the start of the game. The first card on the Discard pile cannot be a Draw Four Wild Card (if it is put it at the back of the pack and draw another). The first player must match the number or colour of the first card. If the first card is a word card it is as if the dealer played that word card for example if the first card is a Reverse Card then the player to the right of the dealer gets to put a card down first. 3/ Players continue to put down their cards, trying to discard all their cards before everyone else, but they must abide by the restrictions of the card played before them. If a player cannot put down a card of the same colour, same number, same word card or a Wild Card they cannot put down a card and must pick up a card from the Draw pile. 4/ Once you have only one card left you yell “UNO!” If another player notices you have only one card left and you haven’t called UNO yet then you must pick up another two cards. 5/ After the last player has put down their card the hand is over. Score the points gained from the other players’ hands and allot them to the winner – then it’s time to start a new round! Uno is designed for up to 10 different players, but if you only have two players the rules change a little. The direction of the game obviously can’t be reversed when you’re only playing with two, so Reverse Cards become Skip Cards (and whoever put the card down gets to play another card). Also after a Draw Two Card is played whoever puts the card down immediately gets to have another go. Aside from these little alterations the rest of the rules remain the same. Elimination Uno: Instead of playing around who has the most points at the end of the game, an elimination version of Uno puts the focus on avoiding points. Once a player successfully unloads his hand in a round all other players must add up the points in their hand and keep them. When a player reaches 500 points they are eliminated from the game. The last man standing wins. Speed Uno: This variation on the game let’s you take over someone else’s turn if you’re quick enough. If you have the exact same card that’s on the Discard pile you may put it down before the next player has their turn. The play will then continue on from you. Pirate Uno: This version of the game makes Uno more boisterous than it usually is. In Pirate Uno whoever puts down a 7 card can swap hands with any other player, and every time a 0 is played everyone gives their hand to the person to their left. In this game you’re encouraged to cheat, try to look at other peoples hands and you can put down a wrong card as long as no one else notices. Uno is quite a basic card game. There are many variations to the game possible. Get creative and see what works well for you and who you’re playing with. There are a number of themed Uno card packs including; Disney Princess Uno, Dora The Explorer Uno, Glee Uno, Pokémon uno, Simpsons Uno, Star Trek Uno, X-Men Uno and countless more. In Australia you can also order customised pack of UNO cards on MyUnoCards.com.au. You need to download their software to design your pack of cards. The design process is pretty simple from your end – just select a few of your favourite photos to be in the middle of your playing cards. Once you’re happy with how your pack looks, you can place an order and have it delivered to your home. 1: Person can say UNO after he/she extracts the second to last card from his hand? 2: Person can say UNO when he touches the second to last car in his hard. 3: Person can say UNO simply when he has two cards in hand and is ready to play the second to last card.